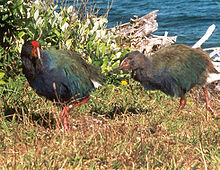 Porphyrio hochstetteri (Maoriane: takahē), avis in Nova Zelandia endemica, est exemplum taxi Lazareni. Lazarenus effectus vel taxon Lazarenum est resurrectio animalis quod exstinctum creditum erat. Origo nominis est fabula resurrectionis Lazari ex morte per Iesum Christum, in Evangelio secundum Ioannem relata. Heuvelmans, Bernard. 1959. On The Track of Unknown Animals. Novi Eboraci: Hill and Wang. Shuker, K. P. N. 2002. The New Zoo: New and Rediscovered Animals of the Twentieth Century. House of Stratus. Novissima mutatio die 28 Iulii 2016 hora 16:03 facta.